A step apart from the rest of Bangkok’s night markets, Asiatique The Riverfront has created a new concept that fuses an outdoor shopping centre with the raw fun that we love about more conventional night markets in the Thai capital. Asiatique is a great spot to pick up some great souvenirs to take home – including a particularly strong range of handicraft-type goods – as well as to enjoy a fun evening out with plenty of food, drink and riverside views. Asiatique is located just a short way down the Chaophraya river from Saphan Taksin. 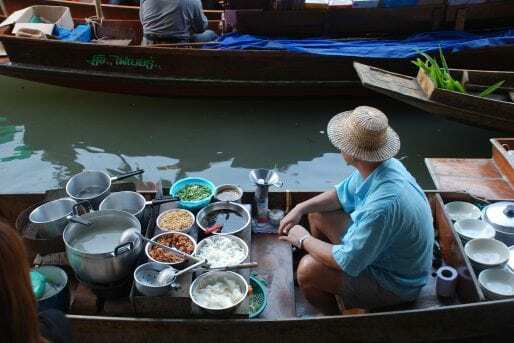 This popular interchange between the BTS Skytrain and the Sathorn central river boat pier that makes it easy to travel on the water past a number of Bangkok’s top sights and towards the Thai capital’s old town of Rattanakosin Island. What is now a popular night market began life as an international port, used for trade between Europe and then Siam. The iconic warehouses on the site were home to the East Asiatic freight company, and it is the design and atmosphere of this warehouse plot that has inspired the Asiatique night market, which aims to combine the vibe of a market and the value of a ‘living museum’ of the ways of Bangkok’s past. Far more of an organised affair than even the most well managed of Bangkok’s other more laid-back night markets, Asiatique has bricks-and-mortar shop units, with over 1,500 retail vendors and dozens of restaurants packed in beneath a replica of the colonial-style former warehouse setup. You’ll also find nightly performances taking place in the two cultural theatres, where everything from cabaret to traditional puppetry is on show. This really is one of the most organised night markets you’ll find in the city – there’s even a map to help you get from A to B! Different zones of the market cater to different tastes, depending on what you’re looking for – from shopping to cultural shows, and from historical artefacts and exhibitions to bars and restaurants – and a free tram service connects the different zones, making it easy to get around. Asiatique also makes the most of its attractive riverfront location with a sizeable boardwalk that enjoys pleasant views out over the water and across Bangkok’s skyline. A ferris wheel, called Asiatique Sky and essentially a scaled-down version of the likes of the London Eye, also offers impressive views out over the city, though it has attracted bad press in the past for deceptively charging Thais and foreigners different rates. On the shopping front, there’s a solid variety of goods on offer that runs from fashion to handicrafts, jewellery and more. You’re sure to find something no matter how big your budget, too, since Asiatique plays host to everything from cheap-and-cheerful fashion pieces and knock-offs to higher-end local designer brands. You’ll also find top-range electronics, while dining and drinking options stretch from high-street fast food joints to high-end local and international fine dining restaurants and smart wine bars. Asiatique operates a free shuttle boat service between around 4pm and 11pm from Sathorn pier, beneath BTS Saphan Taksin station – the queues can be long at peak time, but it’s still preferable to coming by road, since the traffic around Asiatique can be horrendous at the best of times. Which is your favourite night market in Bangkok? Let us know in the comments! Photos by chee.hong; Michael Saechang; Prachanart Viriyaraks.